© 1995 - 2014 Bryan World Productions. All Rights Reserved. "You have to understand something: Los Angeles, CA is Hollywood. We create software - programming - that programs people all over the world. Cultures are changed by what we create here." 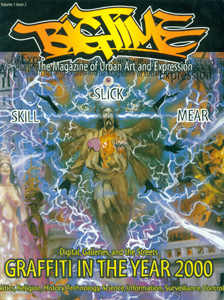 So says Bob Bryan, creator of 1995's Graffiti Verite' documentary on L.A.'s graffiti art. Bryan (who owns his own video production company and is a longtime Hollywood filmmaker/producer) should know. His stripped-down approach to the diversity of politics, age, class and philosophy within the "La-La" writing scene has won him countless awards and acclaim the world over. Bryan got the idea for doing the documentary on graffiti art after meeting artist TOONZ one night in a Hollywood alley while the artist was working on a canvas for an opera. Shocked at what seemed to be an odd combination of ideas ("graffiti," "canvas", and "opera", Bryan began asking questions. " What I found out was that truly these were artists and that the mediums they work on far exceeded the stereotypes. I found that they weren't criminals, vandals, or gangsters, but artists who had something to say. They had an art history and an aesthetic that I knew nothing about, and I thought that if I knew nothing about it, then there had to be a large number of people who knew nothing about it. I thought that it was valid in terms of what they were saying. "So began the process of documenting the culture." My intentions were to counter the programming that was put down by traditional, conventional media sources which basically, for some reason, wanted to show graffiti art in a negative sense; and I realized it was very positive. I wanted that story to be told... I've always said that the graffiti art movement was like a movement with a bad publicist. If we look towards the media's image of graffiti we would think of graffiti artists only in a negative sense; TV depicts writers negatively and print depicts writers negatively. Therefore, the audience or public perceives graff artist negatively because they get their information from the media. Once people see... (Graffiti Verite') they invariably turn their view around. It's just a lack of education-they're not educated as to what's really going on with the graffiti aesthetic. They haven't been exposed to the positive nature of it. They have been programmed by negative programming. Verite' means truth and - for me - the only way to get the truth out would be through the writers." To that end, Bryan deliberately withheld the opportunity to give the haters equal air time. "That point of view is already out there - strong. What would create balance in software-in terms of programming-would be the graffiti artists' point of view. I definitely structured (the video) in a way that would change people to understand that it isn't about this commune idea-this "group think", it's about independent artists." Not content with ending it there, Bryan organized The First International Graffiti Art Competition earlier this year because, as he says, "I felt it was time now for people to understand the international socio/political context that graffiti comes out of; that it isn't just something that happens in L.A. or New York, but something that has evolved out of history all over the world ' I wanted to educate the world audience to the "big picture..' The winners of the competition will be included in Bryan's follow-up video, The Art of International Graffiti, which is currently in its final stages of completion. Judging for the competition was done by a cross-section of gallery curators, actors, painters, doctors, lawyers, and even some graff heads (including members of the BIG TIME staff), and it was held at the Museum of Arts, Downtown Los Angeles in late August. Work was submitted from Russia, Guam, Puerto Rico, Australia, Denmark, Germany, England, Canada, Cleveland, the Bronx and even Pasadena. The winners will be receiving plaques in honor of their achievements by mail. Of the competition, Bryan states " I sincerely hope that the positive media exposure that the winners receive will turn a lot of heads in the direction of learning to appreciate on all levels- this emerging and dynamic art form that truly transcends all stereotypes and gross generalities." So do we. BIG TIME MAGAZINE, Article reprinted with permission of BIGTIME Publications.